A homestead surrounded by trees, nestling on a tree leaf, is depicted in the centre of the obverse. The inscriptions LATVIJAS REPUBLIKA, arranged in a semicircle, and 1 LATS are placed above and beneath the central motif. The right field features the portrait of Rūdolfs Blaumanis on the background of the titles of the writer's works. 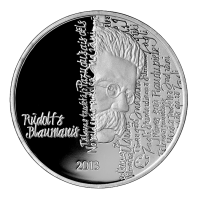 The inscription "Rūdolfs Blaumanis" is placed in the left lower part of the reverse, with the year 2013 below the portrait. It seems there is hardly any Latvian who has never seen "Skroderdienas Silmačos" (Tailor Days at Silmači) by Rūdolfs Blaumanis (1863–1908), with its Midsummer Night's atmosphere and vivid characters drawn from rural life. The comedy "No saldenās pudeles" (From the Sweet Bottle) also pokes inoffensive fun at country life and morals. This master of humour was the editor of the satirical supplement "Purva mala" (On Swamp's Edge) to "Pēterburgas Avīzes" (St. Petersburg Gazette), a Latvian newspaper out of St. Petersburg in the early 20th century and later in the newspaper "Latvija". Yet Blaumanis's most important contribution to Latvian literature is his serious work in fiction and drama: "Indrāni", "Ugunī" (Into the Fire), "Nāves ēnā" (In the Shadow of Death), "Purva bridējs" (The Swamp Wader), "Raudupiete", "Salna pavasarī" (Frost in Spring) and many others. They draw their power from the masterful depiction of entangled relationships and contradictions among people and their often tragic resolution. Blaumanis's works lack pseudo-national sentimentality, the life they reflect is never idealised. There are hardly any among Latvian writers that have portrayed the life and way of thinking of country people as realistically and impressively. The timeframe in these plays and short stories is the turn of the 20th century when Latvians started thinking of themselves as a nation and the foundation was laid for future statehood. His protagonists are rooted in the Latvian nature, yet their appeal is universal. The search for human harmony is centred around the ideal of family and native land. It is hardly surprising, given that Blaumanis lived in one of the most picturesque places in northern Latvia. The portrayal of Latvian national character in Blaumanis's literary works bears comparison with his Swedish contemporaries Anders Zorn and Carl Larsson who in their art gave a concentrated visual definition of a typical Swede, his or her lifestyle, principles and worldview. This national character is not fixed historically: many of the themes and problems related to it can be found in contemporary life as well. The motifs found in Blaumanis's works have inspired also film directors, notably Jānis Streičs who once said: "Blaumanis has written down the code of our national character and if we can decipher it, we get closer to our roots and our self-respect. Through this code we assign our nation's story to eternity. Whoever deciphers this code knows who Latvians are." My pride is my people's pride! Shall perish and ride to hell!" 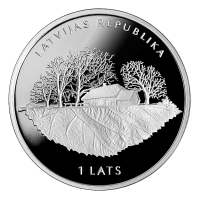 Celebrating Rūdolfs Blaumanis's contribution to Latvian culture as a veritable gold deposit, the Bank of Latvia has issued a coin dedicated to the 150th anniversary since his birth.